Recently my husband and I took a flight to Prince Edward Island (Canada). While there I did something I never do, ate at the same place 3 times! Usually we seek out ethnically diverse, unusual and inspired or inspiring food. However April in PEI, means not so much choice! Before we headed over I did an intensive search of open restaurants that can easily and happily accommodate Gluten Free with more than just a salad! Which brought us to Brits. I do have to say it was the best GF fish and chips I have ever eaten. Not my normal diet by any means but sometimes you just have to treat yourself! Before the flight home we went back mainly because we knew it was safe. This time I ordered the English style vegetable curry. Again not normally my favorite style, when you grow up on homemade Indian cooking nothing else can compare. BUT I wanted something easy on the digestive tract and with it being an exceptionally cold April day I wanted, scratch that, needed the heat! I was not disappointed! The curry was highly satisfying. Soooo… What makes it British? The mild flavours! 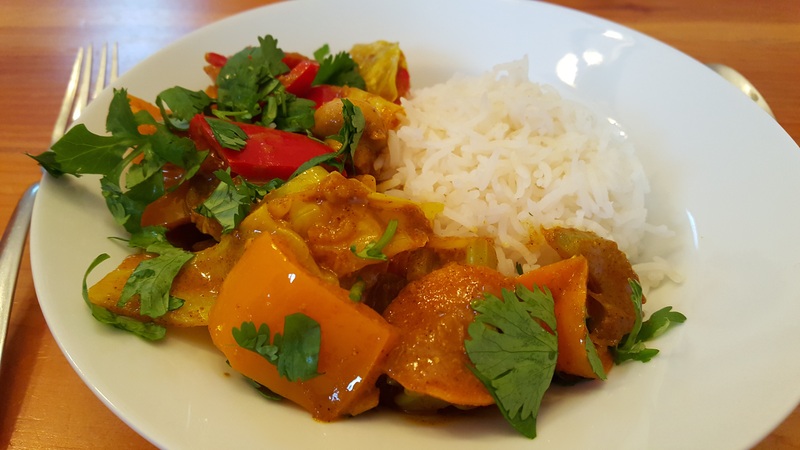 Even though it is mild with MUCH less seasonings, this style of curry still offers most of the health benefits of it’s eastern inspiration. Ok Now to the Healthy Stuff! Curry, Turmeric, Cumin, Onions: the main flavours of any curry are also the stuff that keeps you healthy. Really each one of these deserve their own blog post; and perhaps one day soon you will find those here. For now though, just the basics. Turmeric: This bight yellow/orange little root not only provides the deep rich colour of a good curry; it helps control inflammation as well! For centuries eastern science has taken advantage of this roots properties in the fight against inflammation. Curcumin; the pigment that provides the beautiful colour is the stuff that makes it comparable to heavy duty anti-inflammatory drugs such as hydrocortisone, phenylbutazone, Motrin and Advil. Want a great in-depth article about turmeric click here. Onions and Garlic: Considered a superfood garlic and its cousin onion contain allicin the main substance that provides an anti-viral action. These bulbs provide great protection from viruses of all shapes and sizes. Studies show that groups of people who consume raw garlic specifically have greater resistance to colds, flues, and a lower incidence of particular types of cancer than the general population! Okay enough of the lecture let’s make some curry! Vegetables: red peppers, green peppers, cauliflower, carrots, butternut squash, cabbage, button mushrooms A long list but really, you can add any vegies you like and omit those you don’t! You want about 4 cups of chopped vegetables all together. This is loose guide line. Peel and cut onion into chunks. 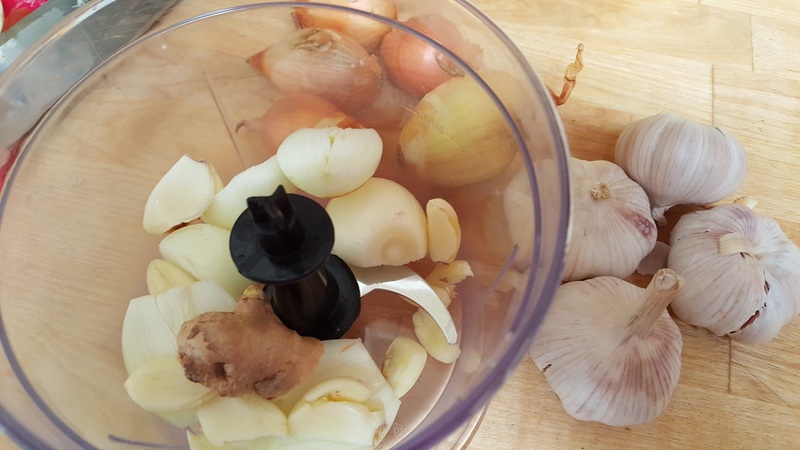 Remove skin from garlic. Now i use my mini chopper for this next step. How you chop is up to you! 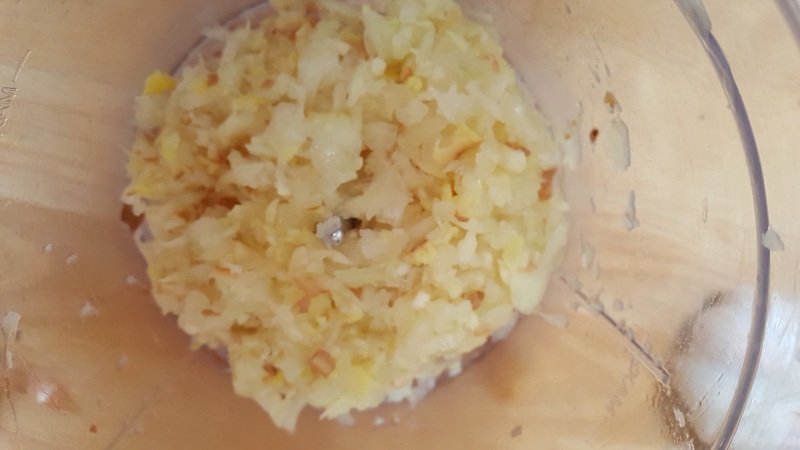 Place onion, garlic and ginger root into chopper and whirl until finely chopped, almost smooth. Prep the rest of the vegetables by peeling, de-seeding and washing. Cut up all vegies into bite sized pieces. Grab a pot or pan large enough to hold all of your vegetables. On the stove top heat oil then add in chopped onion, garlic and ginger and cook on low heat until translucent and very soft. Add in curry, turmeric and cumin powders cook for 1 minute then add in chopped vegetables. Stir fry for 3 to 5 minutes. 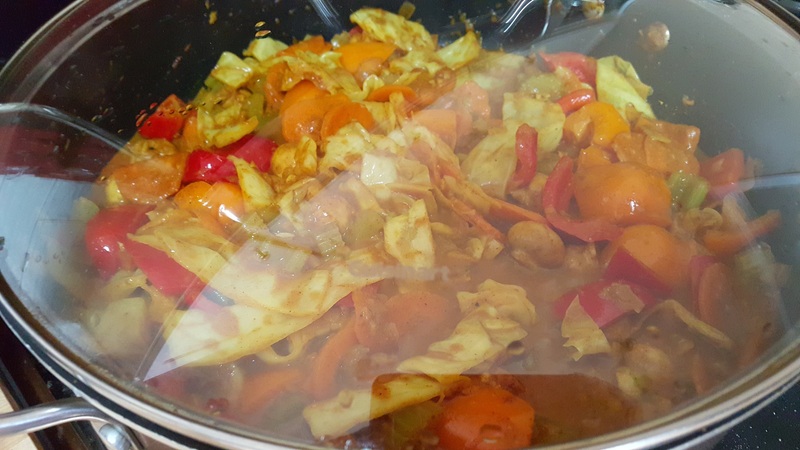 Add in vegetable stock, place lid on pan and let cook until vegies are the texture of your liking. Traditionally nice and soft but I like mine el dante! 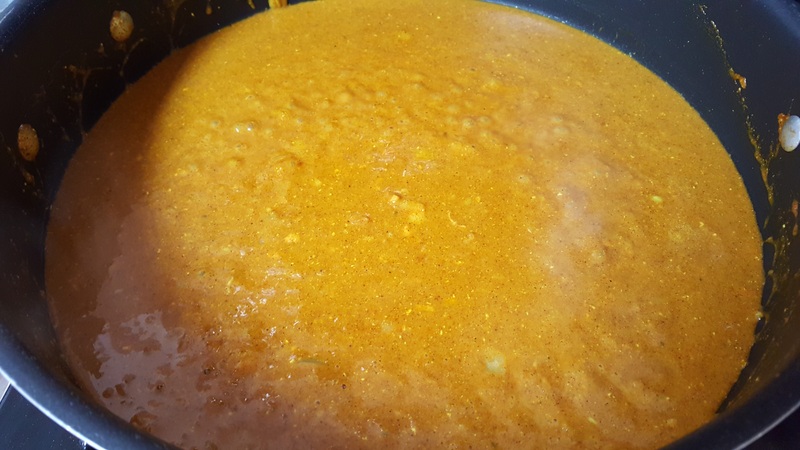 If you like a creamier curry add in 1 can of coconut milk just before serving. On this day my vegies of choice were: 1 large red pepper, 1 large orange pepper, 1 pound button mushrooms, 1/2 of a medium sized cabbage, 3 stalks of celery and 4 carrots sliced. This made enough to feed my family of 6 for 1 dinner and lunch for 3 adults the following day. Once cooked eat right away or save for later. I always make a giant pot, curry only gets better with age so this makes for a delicious midnight snack or lunch the next day! Serve over a bed of Basmati rice or with a naan for of those of you who can do gluten. Sorry I don’t have a good Gluten Free Naan or chapati recipe, if any of you do please share I would be happy to link it to my post!. I hope you enjoy this classic as much as my family and I do! Let me know!! I shared this on my facebook page! Looks amazing and I can’t wait to try it.